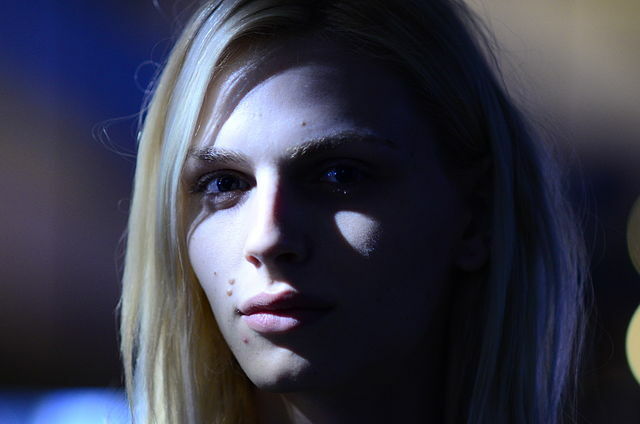 Andreja Pejic was born in Tuzla, Bosnia and Herzegovina, on August 28, 1991, is an Bosnian-Australian model. Pejic was discovered at the age of seventeen, at a swimming pool in Melbourne by model scout. He is a transgender model who changed from being a man to a woman. Became the first openly transgender model profiled by Vogue in 2015. Walked both the men's and women's fashion shows. Featured in music video for David Bowie "The Stars" (2013). Was a guest judge on Britain and Ireland’s Next Top Model (2012). Dated fashion designer Duran Rembrandt (2013-2014). Pejic made her big screen debut in action thriller film The Girl in the Spider's Web (2018) in role as Sofia, opposite Claire Foy. Bagdad, Florida (2017) comedy in role as Pizza. Reason (2013) short drama in role as Gemma Christensen. Fatih (2013) TV Mini-Series in role as Radu. Citizen K International Cover, Marie Claire Spain Cover, Interview, Vogue Italia, The Wild, Garage, W Magazine, i-D Magazine Covers, Love, The New York Times Style, Dazed & Confused, American Vogue, Teen Vogue, Vogue Korea, Galore, L'Officiel Turkey, Vestal, Modern Weekly China Cover, Zeit Cover, GQ Style Australia, Black Magazine, Fashion Magazine Canada Cover, S Moda for El Pais Cover, Fiasco Covers, Vogue Brasil, New York Magazine Covers. Kenneth Cole, Silvian Heach, Neil Barrett, Hema Lingerie, Auslander, Apropos, Marc by Marc Jacobs. Walked runway for H&M, Giles, DKNY, Jean Paul Gaultier, Jeremy Scott, Bespoken. Represented by agencies DNA Models New York, Bananas Paris, View Management Barcelona, FM Agency London, nest model management Berlin. In this society, if a man is called a woman, that's the biggest insult he could get...Is that because women are considered something less. I like to party. You know, quite hard-core partying. I feel like at this age, it's appropriate. I find myself to be quite sarcastic, and I wouldn't want to be with someone who didn't get that. And I really think people should stop trying to categorize me because of their need for labels. I think professionally I am capable of being very versatile. Fashion is quite inclusive and good at embracing different things and different forms of beauty. It's a very liberal industry. You can be yourself. Just not overweight.